The NFU Cymru Crops and Horticulture Group recently visited Talgarth Mill where they received a guided tour. Talgarth Mill was restored to fully working order in 2011 after being given a new lease of life thanks to a Big Lottery Grant. The 18th century water-powered flour mill is now once more a working mill and is run by a group of community volunteers through a not-for-profit company. The mill produces its own flour which is used in its onside café, The Bakers Table, as well being available for purchase by the public. The flour produced is wholemeal flour which means that all that goes into the mill is the grain – with no additives. They currently mill Herefordshire wheat, organic spelt from Yorkshire and organic rye from Hertfordshire. As well as guided tours, the mill offers educational visits for schools, children and adults, to teach them about the process behind bread making so they learn where their food comes from. 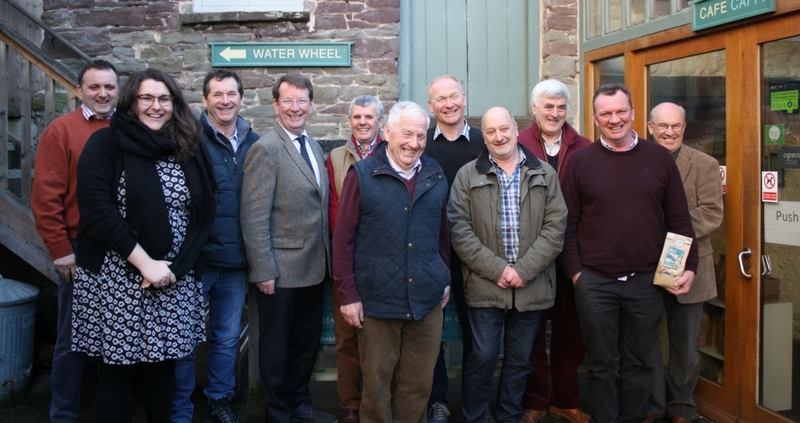 The NFU Cymru Crops and Horticulture Group had a tour around the mill learning about the water powered mill as well as the challenges it faces in the current climate. Run almost entirely by volunteers, the mill packages and brands the flour on site. After the tour, the group held a meeting where they discussed key issues affecting the sector such as Brexit and plant protection products. NFU Cymru Crops and Horticulture Group Chairman, Perkin Evans said: “We had a very interesting day at Talgarth Mill and I’d like to thank the volunteers for spending so much time showing us around and answering our questions.